Arizona gardener and artist, Mary Hysong, of The Edible Garden, snapped this photo of a lavender rose growing in her front yard. I love the extra curliness and softness of the petals along with the lusciousness of the color. I’ve been gardening for most of my life and have been a devoted fan of organic gardening the whole time. It just makes so much more sense to work in harmony with Mother Nature than to fight her. Besides which it is better for the planet and better for our bodies. Here you can see what I’m planting and harvesting, with gardening hints and resources thrown in for good measure. As with other roses, lavender roses have their own special meanings which have evolved over the years of their existence. 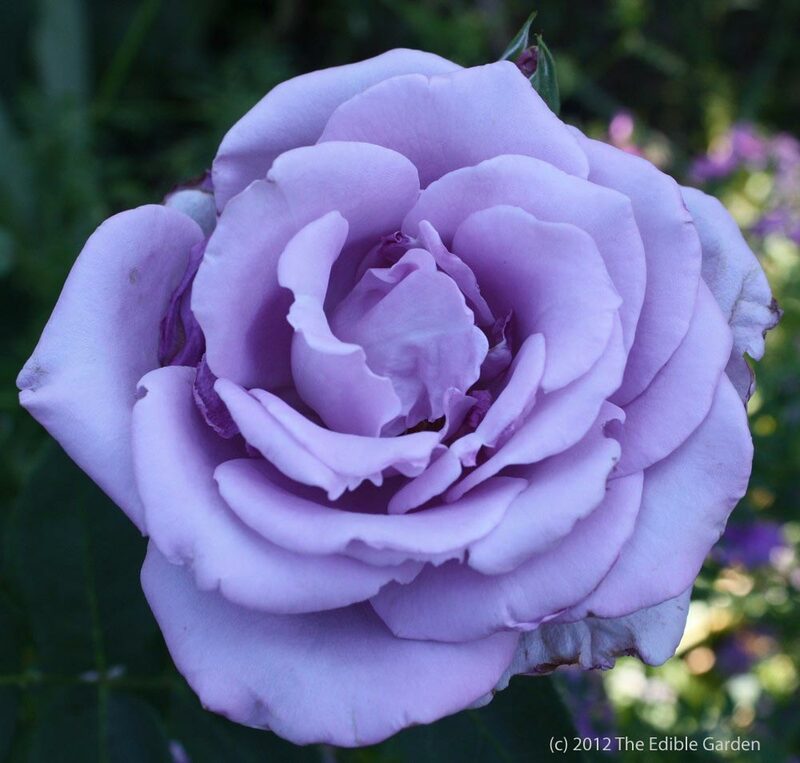 The lavender rose is often a sign of enchantment and love at first sight. Those who have been enraptured by feelings of love and adoration have used lavender roses to express their romantic feelings and intentions. Significantly, lavender is the color that priests wear during lent. This is a time of discretion. Thus, there is also an undertone of rigorous control, or a need to proceed cautiously and slowly. The color lavender also has a traditional association with royalty. In this regard, shades of lavender roses can suggest an air of regal majesty and splendor. Today’s lavender rose invites us to see ourselves as love incarnate. Probably the toughest thing we can do is look in the mirror first thing in the morning and think “love at first sight”…yeah, right. We often go the negative route by berating ourselves. Take a moment today while looking in a mirror to see beyond our physical presence to the truth about ourselves, to connect with the concept that at our core we are expressions of love, we are love.